Towards the end of last year, the National Advisory Committee on Drugs (NACD) published a piece of research entitled 'Risk and Protection Factors for Substance Use among Young People: A comparative study of early school-leavers and school attending students'. The study was commissioned by the NACD. For this feature, we present three pieces of video relating to this research. 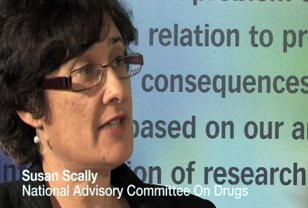 First off, Susan Scally, NACD Director, spoke to drugs.ie and provided some insights into the development of the research. We then provide exclusive video footage recorded at the recent launch of the research report in the Gresham Hotel, Dublin, October 2010. This video features presentations from the research authors, Trutz Hasse and Dr. Jonathan Pratschke. The final video features a presentation entitled 'Strategies to enhance resilience in Irish Teenagers' given at the launch by Dr. Bobby Smyth, consultant child and adolescent psychiatrist. The study identifies a limited number of highly significant risk and protective factors that can increase or decrease the risk of using substances among 15-18 year olds in Ireland. When attention is focused on those factors that are amenable to change, the most important conclusion is that both the family (the young person’s parent above all) and the educational institution can have a major impact on this decision. A key characteristic of substance use among young people involves either progression from one substance to another, the combined use of more than one substance, or their consumption within a context characterised by polydrug use. The most obvious example of this is young people drinking and smoking in a group setting, but other contexts involving combined use of different substances are also evident (clubs, discos, parties, etc. ).